The four-shot (3 shot tubular magazine) L4S Hunter quickly generated the enthusiasm of many. Jim Bellegarde, gas autoloading shotgun expert gunsmith of Cole Gunsmithing in Maine, uses his 3 inch chambered 28 inch barrel Fabarm L4S Initial Hunter for essentially everything. It was and is a beautifully machined and finished autoloader that is reliable, soft-shooting, yet quick and smooth handling. It is also backed by the best customer service and gunsmithing team in the industry: the Caesar Guerini / Fabarm USA staff. Rich Cole, proprietor of Cole Gunsmithing, and others saw the L4S as an idea platform as a clays gun. Now, a couple of years later, the L4S Sporting is a reality. Compared to the L4S Hunter 3 inch guns, the L4S Sporting has a target stock with a subtle palm swell, a wider target rib, an oversized bolt handle and an oversized bolt release. The bolt handle, bolt release, and forearm cap are all accented in Fabarm “Lion Red.” The L4S has a 2-3/4 inch chamber, the way Rich Cole and Wes Lang of Caesar Guerini feels all target guns should be. The L4S Sporting is designed for absolute reliability with target loads. Ejection with 1180 fps 1 oz. loads is positive and robust. That's as light of a payload as I would ever use in a 12 gauge, but others have already used slow 7/8 oz. loads out of the L4S Sporting (Phil from Field and Stream) with no issues. Whereas the L4S Hunting guns are offered with 26 and 28 inch barrels, the L4S Sporting comes with your choice of a 28 inch, 30 inch, or a 32 inch barrel. My test gun is a 28 inch and has excellent balance, essentially neutral balance, right out of the box. It has gained half of a pound from the L4S Hunter, weighing in at 7-1/4 lbs. on the nose. For those who want to cleanly add weight, the 150g Kinetik Recoil Reducer is available from Fabarm that screws right into the buttstock, adding 5.29 oz. That alone will quickly get the L4S Sporting over the 7.5 lb. mark if you wish, and going with the omni-popular 30 inch barrel adds a few more ounces, getting the gun close to 7-3/4 pounds. Like any gun, it picks up a bit of weight when you actually use it, as you can add in the weight of a shotshell or two as well. As you might expect, the Fabarm L4S Sporting comes very nicely presented with a barrel sleeve and a stock sleeve in a $200 Fabarm “Adaptive” lockable hard case by Negrini, with five Exis High Performance extended choke tubes, and a full array of stock adjustment shims. Fabarm has very close tolerances on their walnut. As a result, you can change pads from the supplied 22mm pad to a 12mm pad, a 22mm trap pad, or a 27mm pad and still enjoy a perfect factory fit. 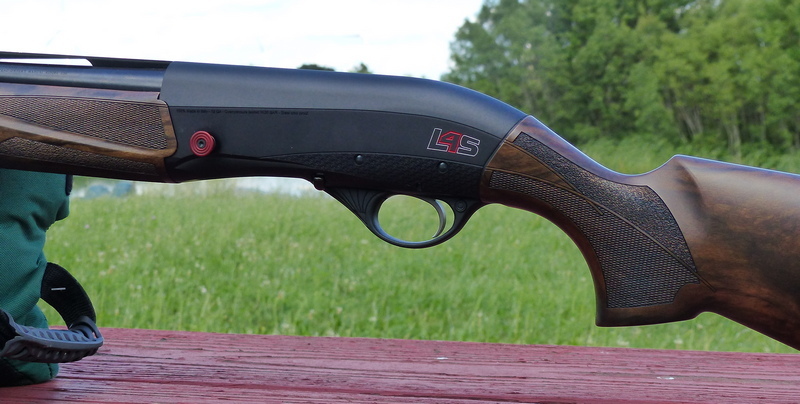 Left-handed shooters have not been overlooked, either, for the L4S Sporting is also available in a true left-hand model with left ejection, in all three barrel lengths. The L4S Sporting prints 60/40 patterns, about 3 inches high at 40 yards. The Exis HP choke tubes are exceptionally well-machined: they don't get dirty on the outside and they don't shoot loose. The walnut is Fabarm's “Tri-Wood.” It is weatherproof, essentially stain-proof, and, unlike some enhanced grain stocks it is readily machinable, a big advantage for those who might want adjustable combs or other custom stock work. MSRP is $1850 for the right hand L4S Sporting and naturally Fabarm USA dealers set their own selling prices. The L4S Sporting is everything I want an autoloader to be. Most of all, it is just really fun to shoot. I went through a case of 1-1/8 oz. loads in short order yesterday and I don't even feel like I went shooting. The 28 inch model is spritely enough so it can serve a bit of dual duty: it is a great choice to make it rain doves on opening day with no question. It is a rare event when an out of the box gun needs no tweaking and is just perfect as supplied. This is one of those rare times, for the L4S Sporting needs nothing changed to be a fabulously good autoloader, for that's the way it comes, right out of the box. Fabarm just made a whole lot of people happy by releasing this model. For more info, see your local Fabarm dealer or refer to https://fabarmusa.com/ . Note: My understanding is that the entire first shipment is already spoken for by Fabarm dealers, but the second shipment has just arrived, so L4S Sportings are available as of this writing. The best bet is to check directly with Cole Gunsmithing https://www.colegun.com/ or your favorite Fabarm USA dealer to see what they have available or to get yours on order. The most popular barrel length seems to be the 30 inch, followed by the 28 inch tested here, and then the 32 inch.